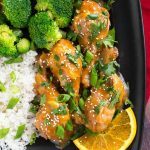 Instant Pot Orange Chicken Legs are a very delicious way to prepare chicken drumsticks. 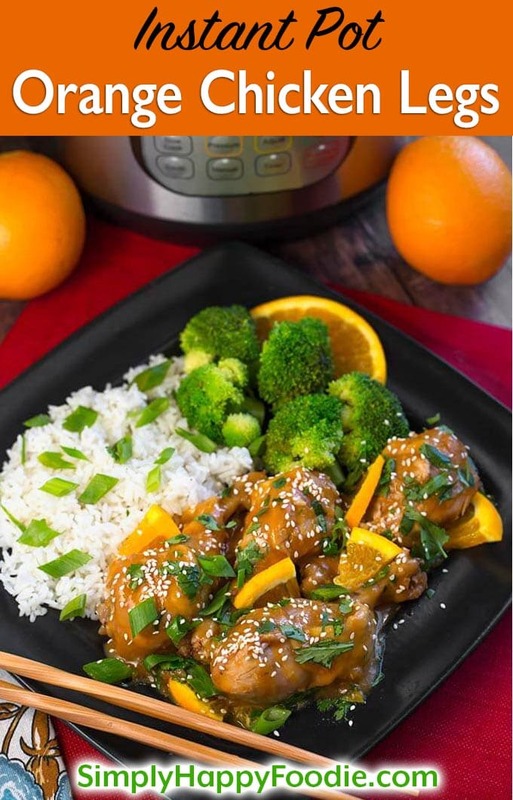 With lots of fresh orange and Asian flavor, this pressure cooker orange chicken legs recipe is sure to be a family favorite. Cook your rice at the same time! This is an Instant Pot dump and start recipe. You might be asking what a “dump and start” recipe is exactly. It’s what I call any pressure cooker recipe that you can dump all of the ingredients in, and start the cooker without pre-cooking anything. With this recipe the only thing you need to do at the end is thicken the sauce, and put the chicken legs under the broiler (optional). That’s pretty simple. 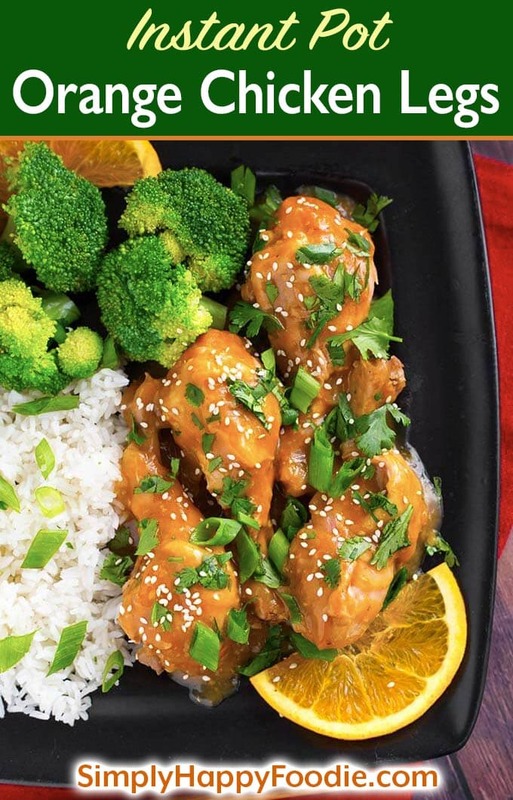 This Instant Pot Orange Chicken Legs Recipe isn’t the fried kind. I wanted to make this recipe a little healthier, as well as easier. 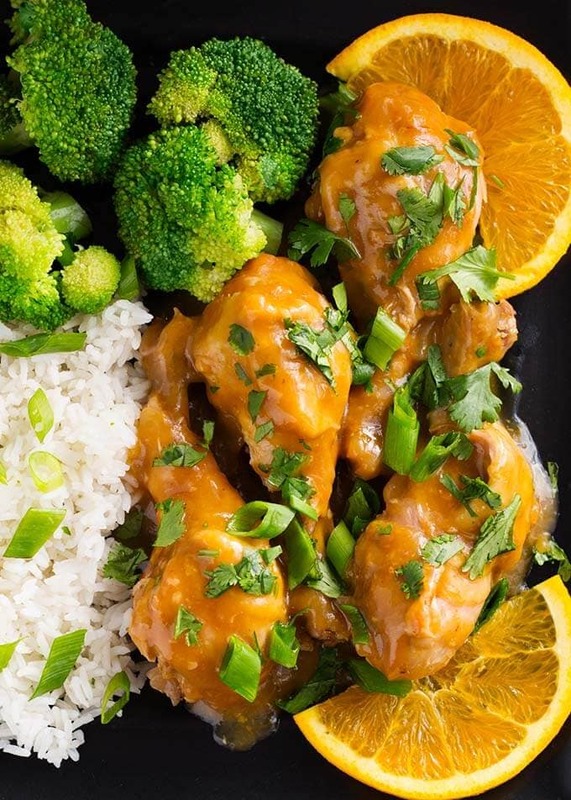 The flavor is bright with the fresh orange, garlic, ginger, and other tasty ingredients. I like to cook my rice at the same time, in the same pot, using the Pot-In-Pot (or PIP) method. What that means is cooking the rice in a pan that sits inside the pressure cooker pot above the chicken legs. I timed it so that both are done cooking at the same time. If you prefer, you can switch out the drumsticks for thighs in this recipe. They have the same cook time. If you want to use chicken breast, you will need to use larger (9-10 oz) sized breasts and leave them whole to keep the same cook time (if cooking rice with it). When you cook chicken breast without the rice, you can cut the breast into slightly larger than bite sized pieces and reduce the cook time. 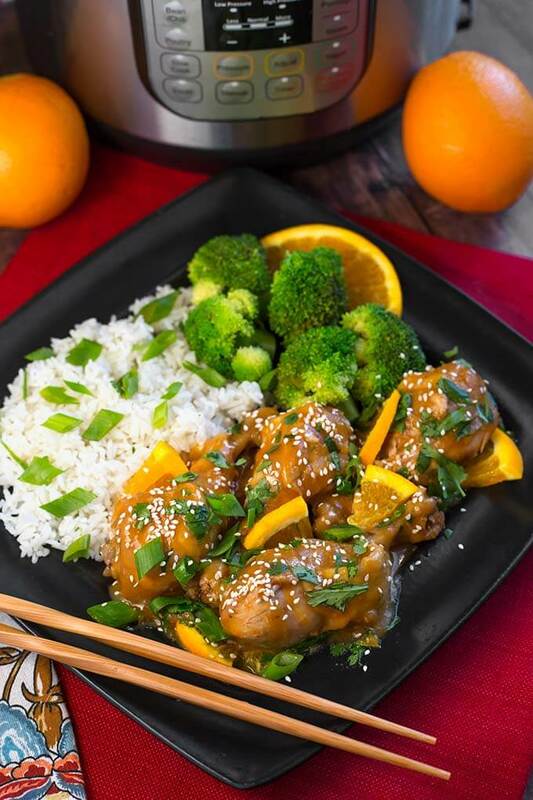 Instant Pot Orange Chicken Legs are a tasty way to prepare chicken drumsticks. 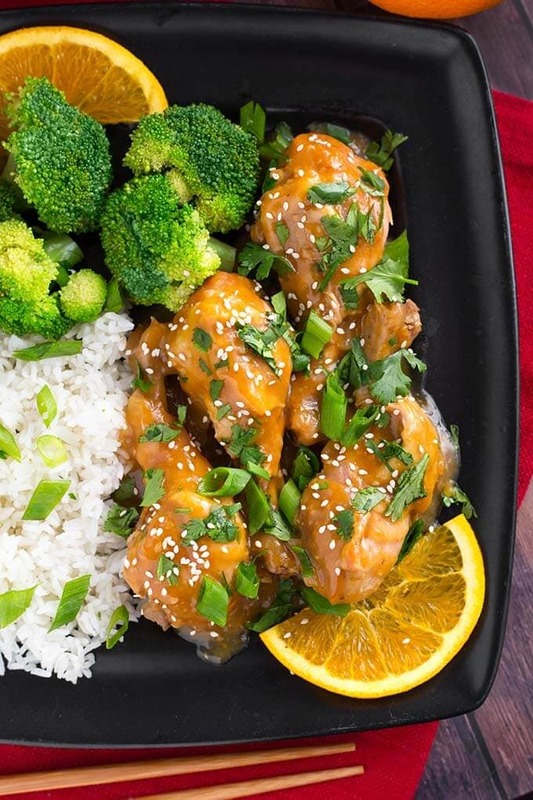 With lots of fresh orange and Asian flavor, this pressure cooker orange chicken legs recipe is sure to be a family favorite. Add the chicken legs, salt, soy sauce, rice wine vinegar, garlic, red pepper flakes, ginger, half of the orange zest, and the orange juice. Press the Pressure Cook/Manual button or dial, then the +/- button or dial to select 10 minutes. It will take several minutes for the pot to come to pressure. When the cook cycle is finished, let the pot sit undisturbed for 5 minutes (5 minute Natural Release). Then turn the steam release knob to the Venting position to do a Quick Release of the remaining steam/pressure. When the pin in the lid drops down, open it up and remove the chicken legs to a foil lined baking sheet sprayed with cooking spray. Turn on the broiler to 375° to start heating it up (only if you want to caramelize the coating). Mix together the corn starch and water (slurry). Turn on the pot's Sauté setting and when it simmers, stir in the slurry. When it thickens, turn off the pot and stir in the brown sugar and sesame oil. Taste and add salt if needed. Pour the sauce over the chicken legs and put them under the broiler if you want to caramelize the coating. Just for a few minutes. Garnish with green onions and serve with rice. In a 7"x3" pan, add 2 cups of rinsed white rice and 2 cups of water. Put the tall trivet over the chicken legs and set the pan of rice on it. Then proceed with the pressure cooking. When you open the lid after cooking, use a pan gripper or silicone mitts to get the hot pan of rice out of the pressure cooker. Fluff with a fork. You can switch chicken legs for thighs with the same cook time.